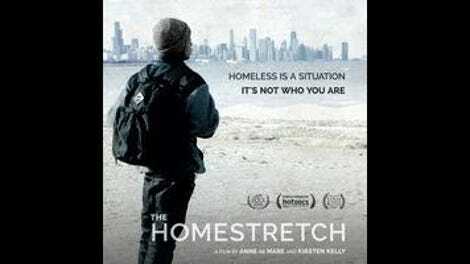 In a moral sense, teen homelessness is very much a crime, and Chicago-based filmmakers Anne De Mare and Kirsten Kelly aim to shed a light on this nationwide epidemic in The Homestretch, using the Windy City as a test case. This empathetic documentary is a portrait of three juveniles—Roque, Kasey, and Anthony—and their struggle to extricate themselves from itinerancy. But the trio also acts as a focal point through which the directors call attention to the many individuals (almost all of them generous) and the larger institutions (almost all of them rickety) that provide support to Chicago’s down-and-out youths. At the start of the film, the three main subjects are already better off than most: The soft-spoken Roque has been taken in by his nurturing teacher, Maria Rivera, and hopes to go to college. Hardened Kasey is living at Belfort House (a shelter that helps homeless youth achieve self-sustainability), though there’s aimlessness evident beneath her tough exterior. Also at Belfort is the whip-smart Anthony, already father to a 1-year-old and studying hard for his GED. It’s impossible not to be moved by the sight of these adolescents trying to better themselves after they’ve already had several decks stacked against them. (Race and sexual orientation are two prime crosses to bear.) The arts are an outlet for all three: Roque and Kasey find deep kinship with Shakespeare’s tragic heroes—he, Hamlet; she, Othello—and Roque even gets to star as the doomed Danish prince in a student production. (Watching this normally introverted young man speak the Bard’s verse with raw fervor is stirring beyond words.) Anthony, meanwhile, proves himself an impassioned poet, though he’s also aware of the day-to-day hardships that can knock even the best-intended person off the path of progress, and so works toward getting a more practical corporate job. De Mare and Kelly stick close to their subjects, compassionately capturing their many challenges—Roque’s GPA struggles; Kasey’s drug relapse; Anthony’s attempt to acclimate to the number-crunching suit-and-tie world—and their triumphs. (There’s a wonderful scene in which Maria gently prods a nervous Roque to approach a college registrar for assistance. When he does, it plays as a small, yet epochal victory—a circumspect young man finally finding his voice.) They also sketch in the larger world of Chicago’s homeless youth, visiting the public schools where the roster of displaced students rises each semester, and hanging out in emergency shelters like the “Crib” where forlorn adolescents hope to procure a nightly spot via lottery. (On average, 15 or more have to be turned away.) The directors are shakier with this macro perspective; there’s a public service announcement aura that the film never quite transcends, clinical fact sometimes eclipsing cinematic feeling. Whenever Roque, Kasey, and Anthony are center stage, however, The Homestretch is heartrending.